I was wondering how the rear bearing carrier on this rotor worked. 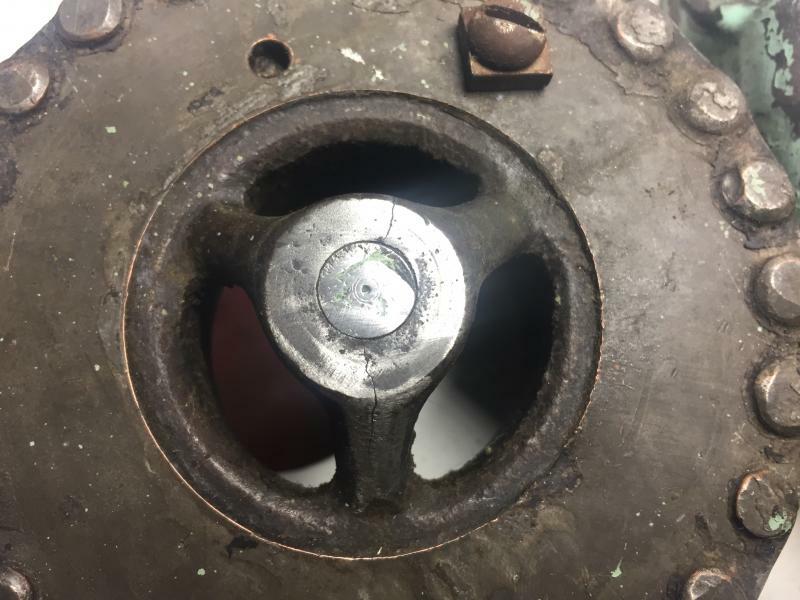 It looks like someone pressed through the shaft so that the rear housing could be retrofitted with a brass press in bearing. Some weird solder blobs and an extra screw were added perhaps for balancing? Why wouldn't someone just press out the front bearing and replace. Seems like the person went through a lot of trouble to destroy this one! I wonder if this should be pressed back flush with an arbor press? Any suggestions on this? It's a shame they destroyed that Trojan like that. Are you planning on rebuilding it? Good for you if you are! That's way beyond my capabilities. If that is the original shaft in the rotor it could most likely be pushed back like it was. You definately have to rebalance that rotor again. 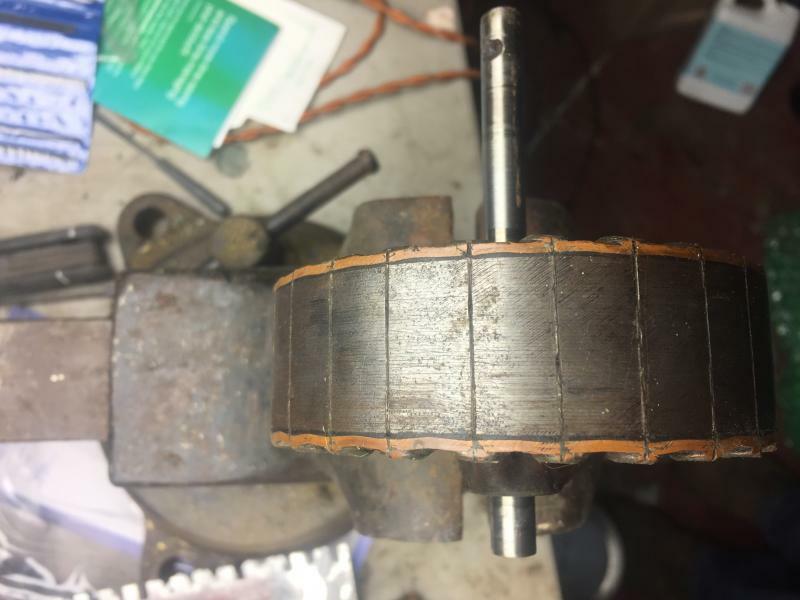 Can you post a few pics of the homemade rear bearing? Good luck with this project. 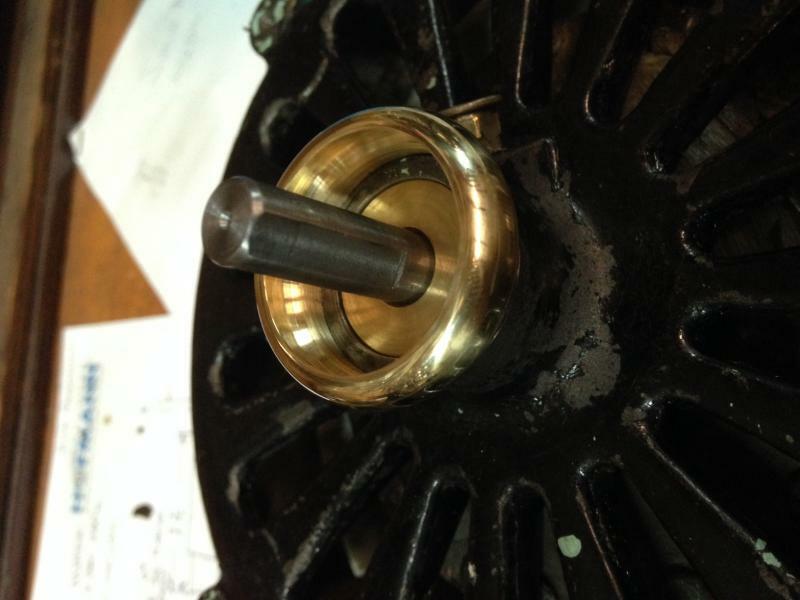 I had a worn out 5110 rotor shaft and bearing I sent to Darryl Hudson to replace a few years ago. 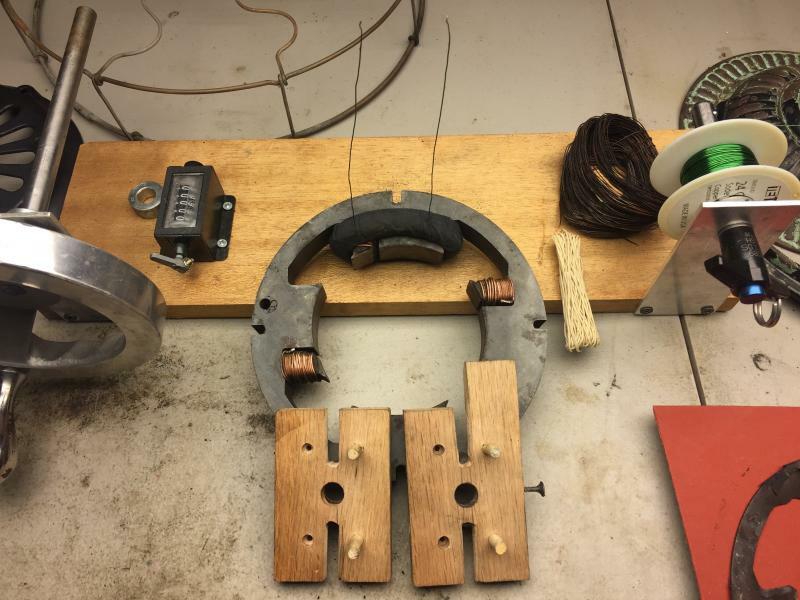 Here are the before photos of the rotor and bearing, which to the best of my knowledge appear original. 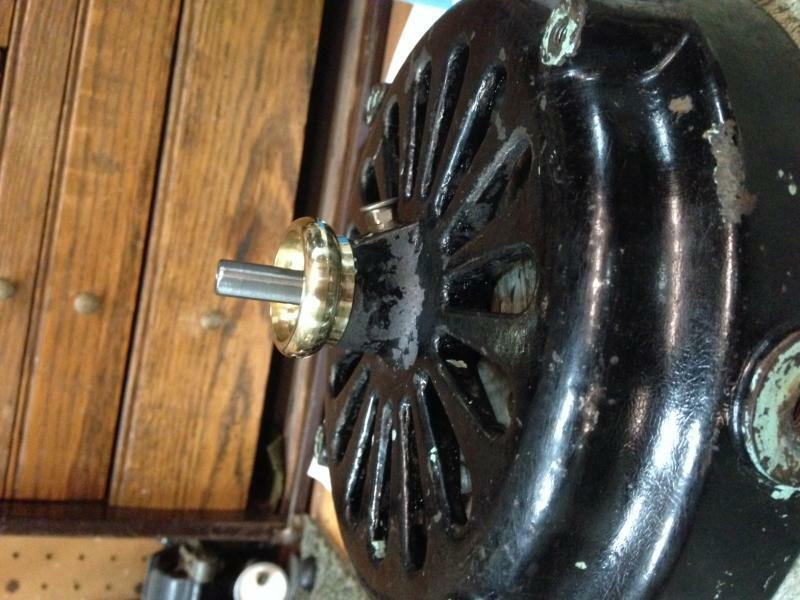 It appears that the original rotor shaft was pinned on the back of the rotor. 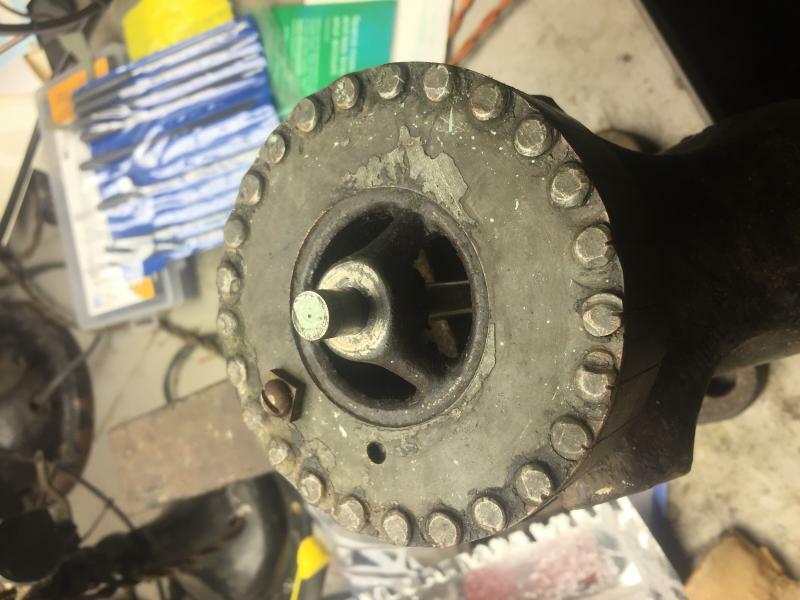 If I had to make an educated guess, I think somebody thought it would be easier to drill through the rear motor housing rather than replace the front bearing and rotor shaft. 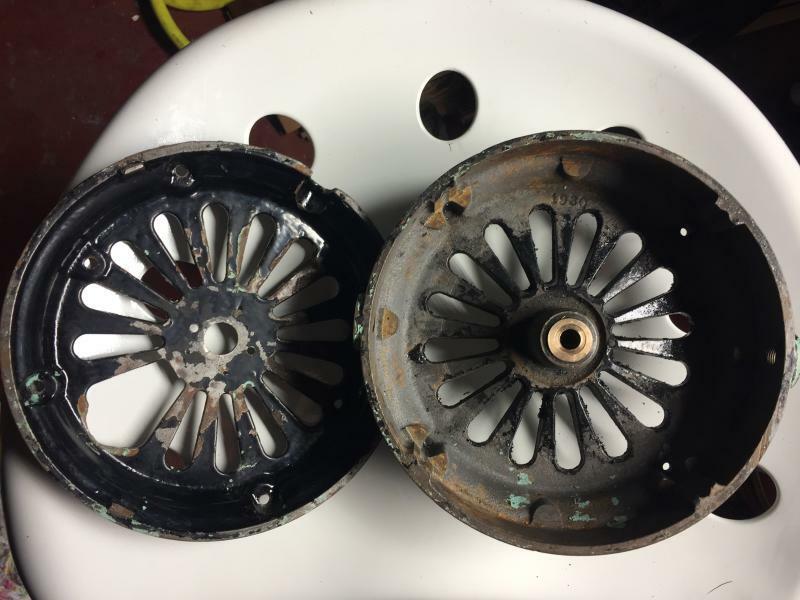 The rotor shaft on my fan was worn out as a result of use with a bad bearing. ... changed my mind in next post. I wonder why there's a round set-screw notch in the front of the shaft on your rotor. I don't remember seeing that on the old shaft on my fan, but then again I didn't work at the factory. 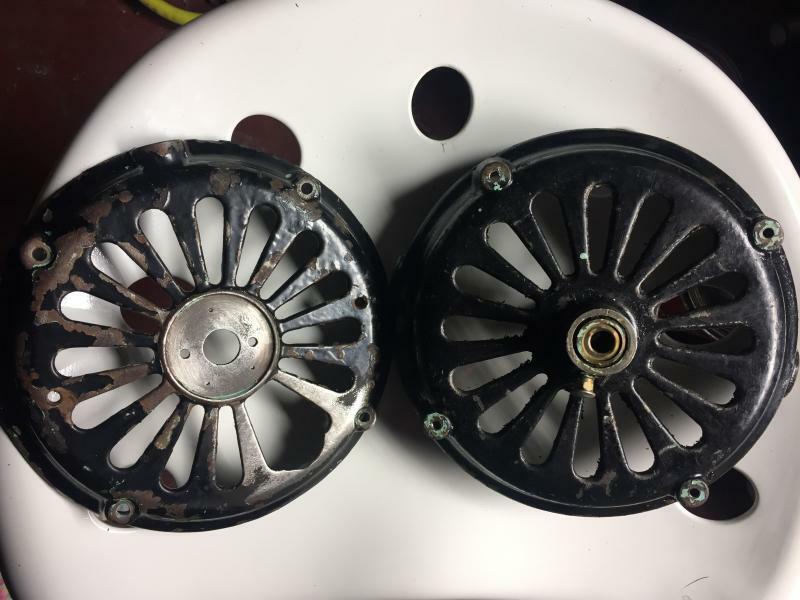 I wonder if somebody replaced the rotor shaft on your fan because it was worn out and went ahead and added the rear bearing and shaft. 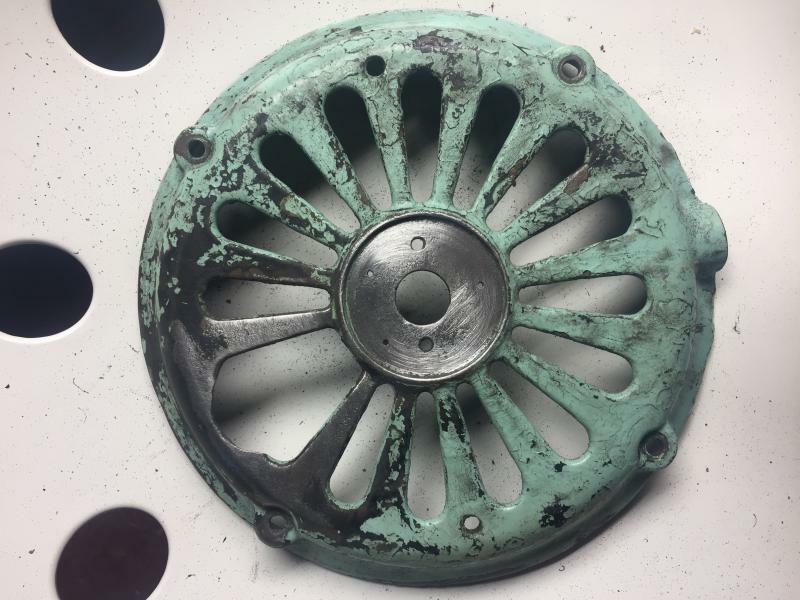 What does the front bearing on your fan look like? If I remember correctly, the bearing has a space in the middle to allow for thread, which absorbs oil from the oiler above. 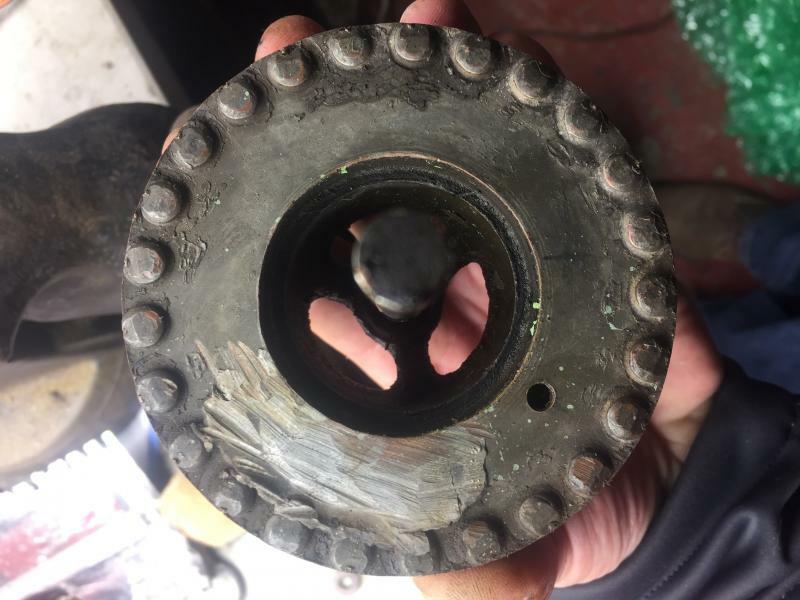 If I had to guess, you'd have to press out the entire shaft with a press, press in a new one and balance the rotor, like Mark said. If necessary, I suppose you'd have to (sleeve the shaft?) 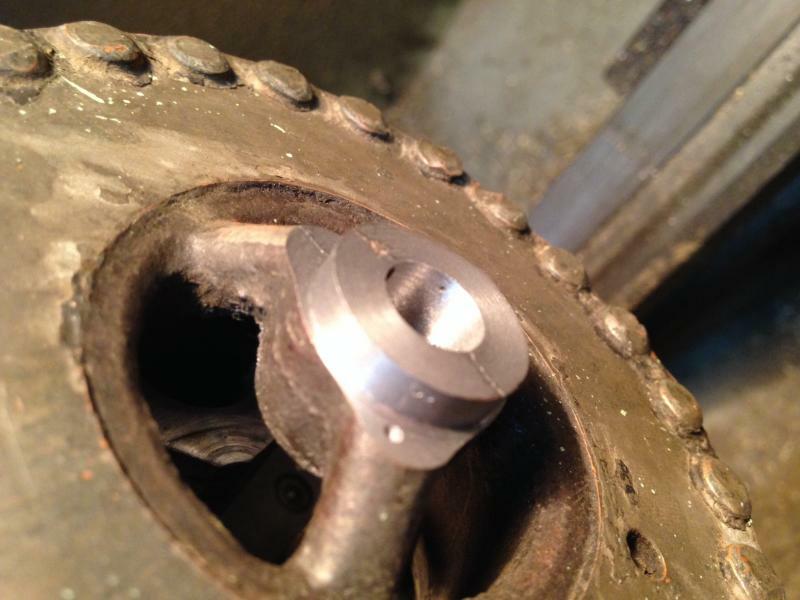 drill to expand the rotor hole if the previous work somehow skewed the original hole where the rotor shaft was added in the factory. 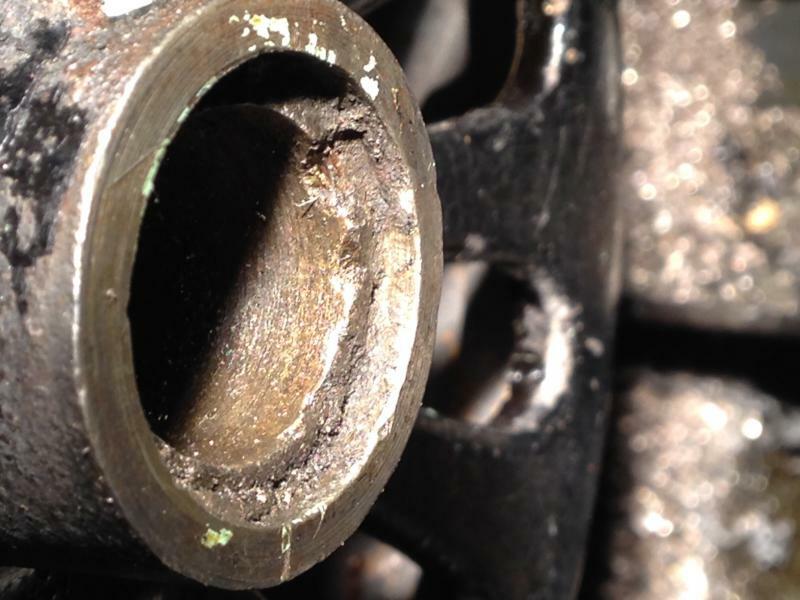 You might end up replacing the bearing. This is a little beyond my skill level. There was a slight hairline crack I noticed after hitting it with the Dremel. I pressed it in lightly and got it flush. the shaft is in pretty tight. I have a 52646 Trojan blade I tried to put on the shaft and shaft was a hair too big for the blade hub. After inspecting the shaft sticks out very far through the front housing. I believe it may be a larger replacement. Anyone know how long the shaft is suppose to be? 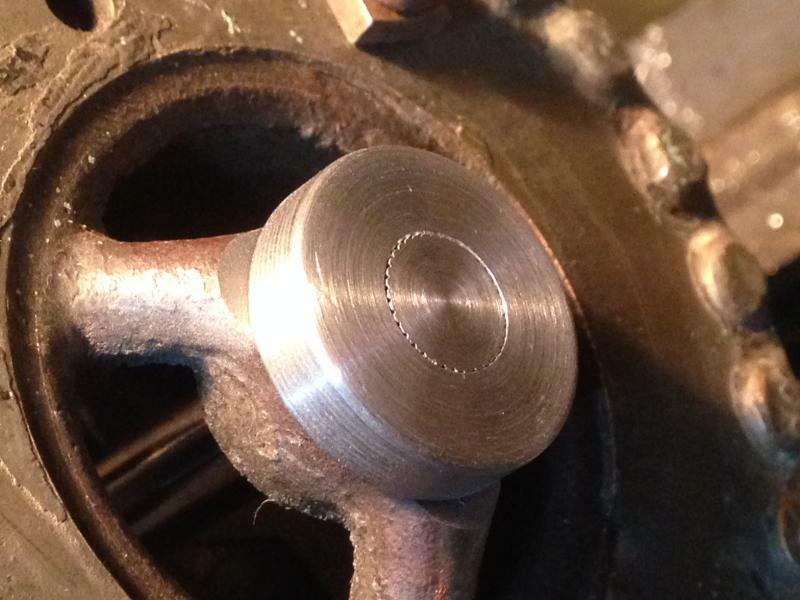 Bearings have been drilled and sleeved on this one. If I didn't know better I'd think ole Mr. Fantastic has had his mitts on this guy at some point. I'm gonna fabricate a spoke and either have a member weld it in place or try Labmetal from fastens. All Trojan shafts have the centering hole on both ends for machining. The shaft for the 5110 (flat to flat or overall length) measures 4 3/8 inches. You always come through Bill. Much appreciated my friend. Mine had no hole at the end of the shaft. Are you going to repair the crack on the rotor? Consistently running a load on that shaft would make me worry that it might slip. Then again, you might not plan to use this as a daily runner. I just don't know. I plan to have Darryl replace the shaft and bearing. Is repairing the crack something Daryl can do? I suppose I should ask him. I responded to your email. Send it to me....ill take care of it for you. I got the wounded soldier disassembled and ready to go out for emergency surgery. 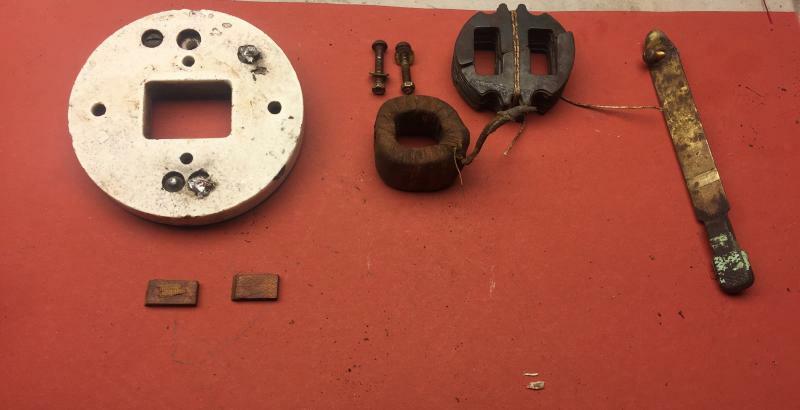 Found that the front motor housing has the number 1930 cast into it and the rear has 1931. Look closely at the second photo. 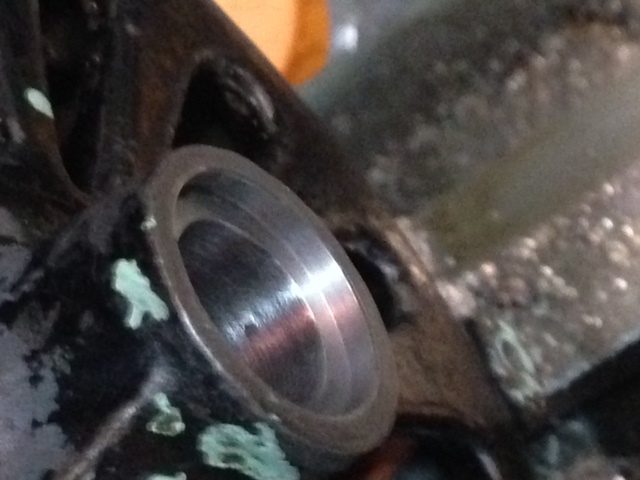 Also you can see where a sleeved bearing was pressed into the original bearing. This will be quite an effort to rehab but I think worth it in the long run. These Trojan Pancakes are absolutely stunning. I love the huge motor and trunnion base. I have long been a GE pancake guy but this fan is making me rethink some things. Is this the correct strut for a 5110? I have seen two types used in photos. All of my open ring Trojans have the straight with a simple bend at the cage end struts but my 5110 has reproduction struts (one original I think). My 2010 has the struts like you picture. Did you check photos in our gallery? The 5110 there has the straight struts also but the 5410 and 5610 have the double bent struts. What about the Trojan 5210 with a 6 wing blade but, still, the thinner motor? I now know who to go to when I need cast repair. Ed Bowers is the man! Looks very good and will only need minimal filling and shaping. I am super happy to have access to our fellow members and their talents! Looks great, I had too zoom in to see where the repair was! Flat struts are on my 5110. 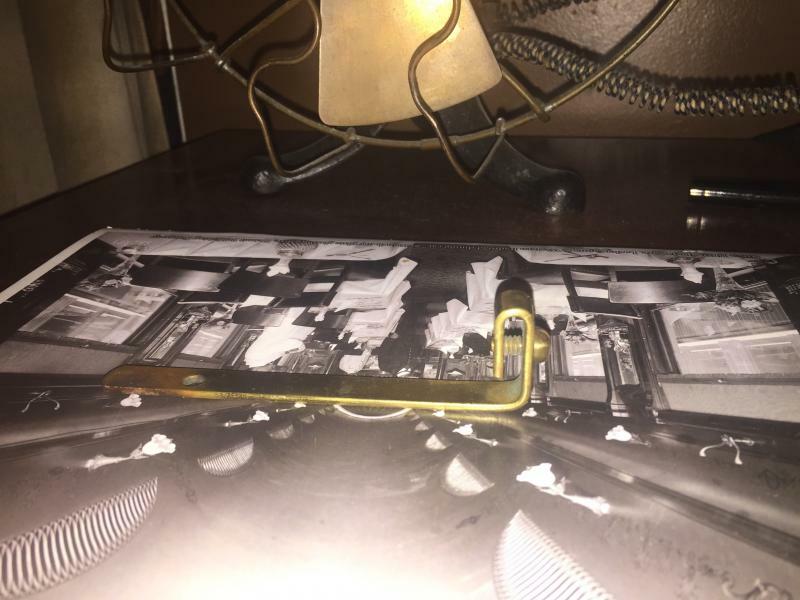 Emerson did not use the term struts, and sold the guards with the "arms" as they called them. I'll use the terms single and double for the number of bends in them. They were single in the early days with most of the open guards, and not listed as separate parts. Later the arms were sold separately, both the single and double. The residential fans with the increased dip (pitch to the young people) to the wings, seems to correlate with the double arms, but there are exceptions like the E. I. 21 of 1900. 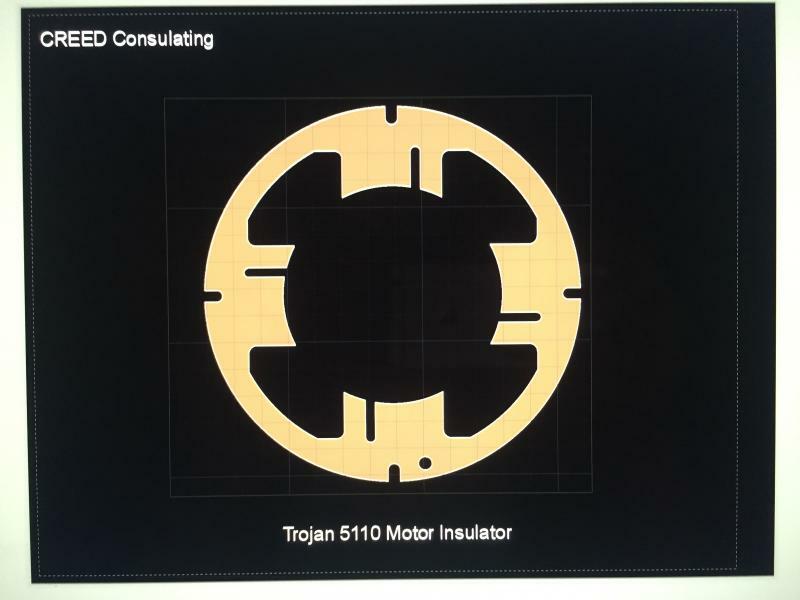 Checking my Trojans & Wescos and many fan and parts catalogs, I find some inconsistencies and know many arms have been replaced with and without the guards, and there are certainly errors in the catalogs. Single arms; 5110, 5120, 5310, 5320, 51646, 51648, 52646, 54646, & possibly 54648. Double arms; 5610, 52648, 53644, 53646, 53648, & possibly 54648. They do note special applications without further explanation! Thank you Bill. I think I am going to make up 4 of the single bend arms unless I can find someone that has some extra laying around they will part with. 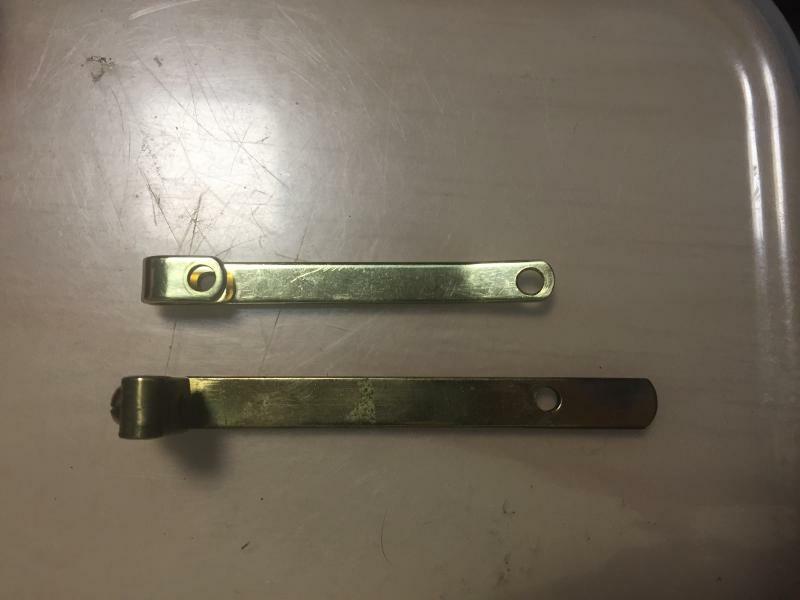 Unless I want to go to the expense of having custom flat stock cut by suppliers I think the best option is to take the 0.093" X .5" flat stock and trim it down to 7/16" (?) which is what I believe the thickness is on the single and double bend arms. Next phase will be to create a motor tag. I am currently matching original fonts so that I can print and etch one out of brass. If I can't get it to turn out to my liking I will reach out to Donald and see if he has time to make me one. Jeff.. If you have a moment could you take a few snaps of the blade hub both front and back. I want to see if it matches my 52646 Lever Oscillator. If it does I am going to remove the wings and have a hub cast up in either steel or bronze. Chances of me finding a blade hub are slim to none I am guess so I will take matters into my own hands. Thank you Jeff. Has anyone every rewound the stator on a 5110. I have a winding rig and have wound several pancake coils for GE's. I'm thinking that the poles are 24gauge magnet wire and the resistance of each coil is about 5 ohms. I am guessing about 300 turns per pole but am too lazy to unwind one to count the turns. Strike 2. Grrrrr. 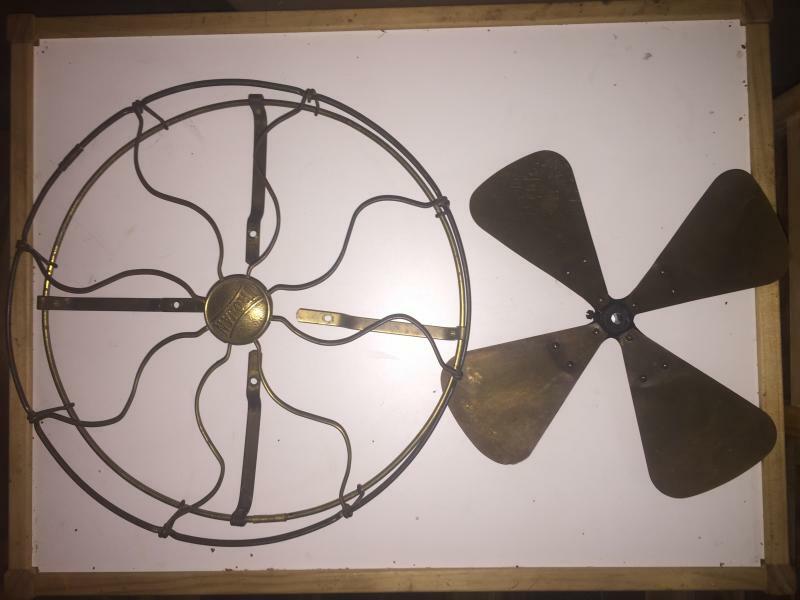 I'm trying to get the "arms" for this fan and have purchase 2 incorrect sets so far. Haste makes waste! What fan models do these little short fella's go on? I need the offspring of these two. Single curve with longer strut past the mounting hole. I will trade!!! I also have a Trojan badged Cage I would be willing to trade for either an open ring cage or a cast blade set like the one pictured. I think these Trojan badged cages were only made for one year and went on both the simple based lever Oscillator and perhaps the stationary model that accompanied it that year. Pm me if you have something good to trade. Anyone interested in the Trojan Cage? I know someone has a 2nd gen lever Oscillator stump laying around. Wedding this Cage. I consider the oscillator on the Emerson 2210 & 2220, and the Trojans the first generation oscillators and the ones on the 12XXXs & the 16XXXs the second generation. Am I missing something? 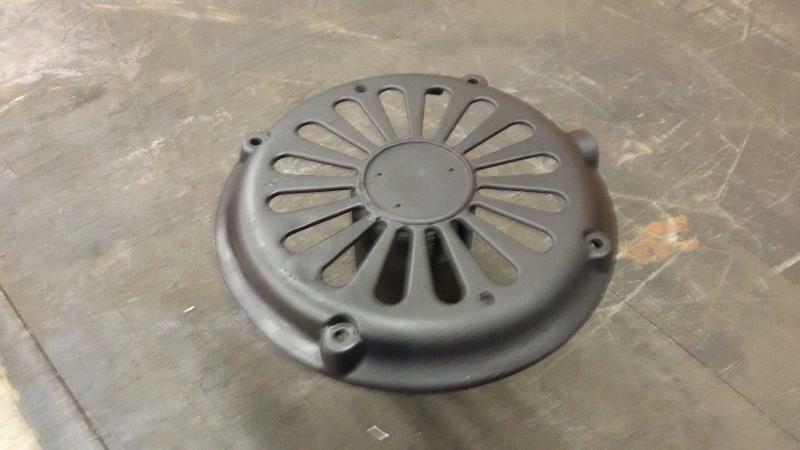 This cage goes on the second gen plain based Trojan fan correct? It came with my Trojan 52646 ribbed base which is a first gen lever. The second gen Trojans used the cage shown correct? Correct. Trojan 53646 stationary and 54646 oscillator smooth base models with three speeds. After that...no Trojans anymore. Too bad as they are a nice addition to the Emerson line. All 1912 Trojans are step base, have the cage emblem and the 54646 and 54648 have 1st gen oscillators. The other two are the 53646 and 53648. 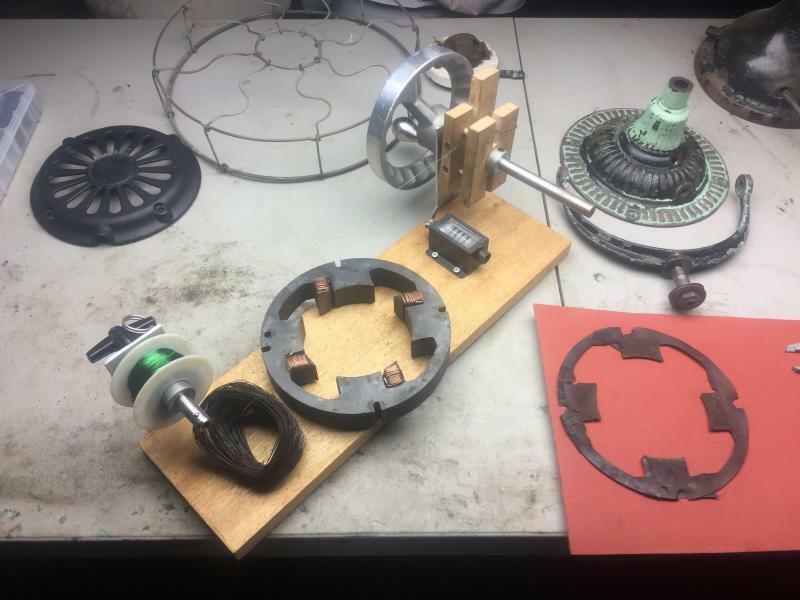 I thought I would update everyone on a little progress being made on the rotor and bearing. 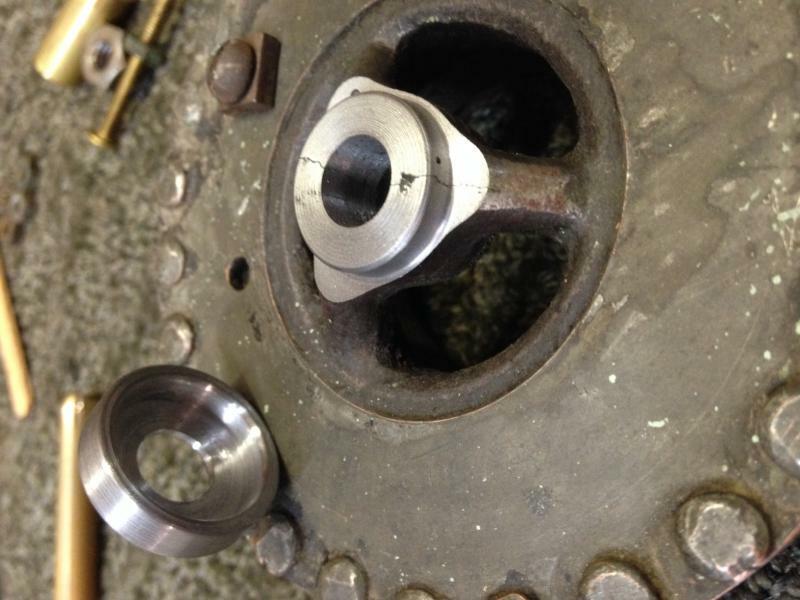 Darryl has been hard at work engineering a solution to the rotor and the butchered bearing/front motor housing. A unique out of the box solution to a problem caused by someone careless. Darryl is really a master of his craft and all around good guy. 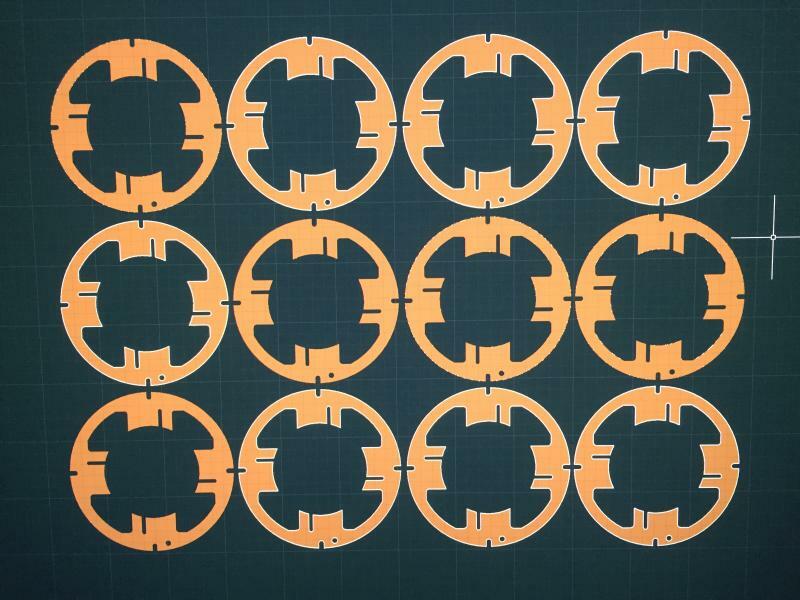 I'm going to draw up some motor insulators in cad and have them laser cut. I'll make a deal with someone if they want to send me enough .040 vulcanized fiber sheet I will have some extra made up and send them back free of charge. Measurement needed from a Trojan owner. 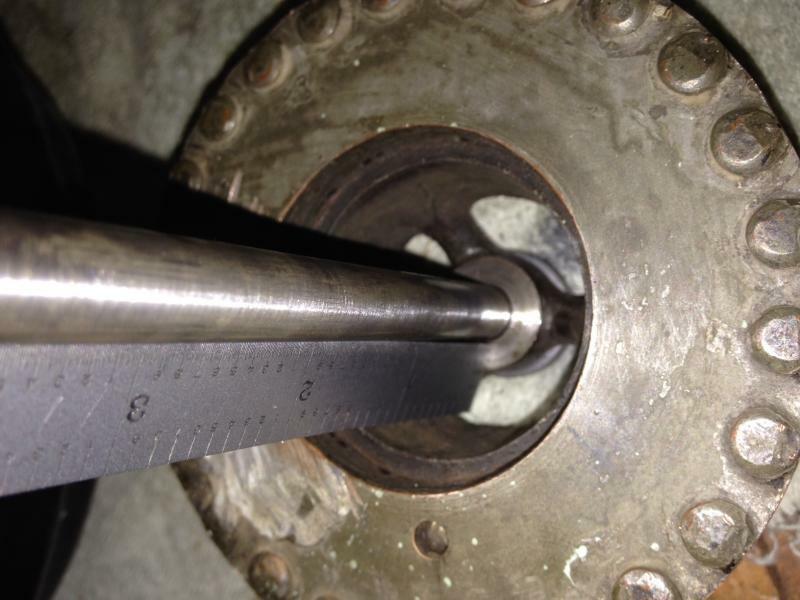 Can anyone give me this measurement shown from the inside rotor, with no washers, to the front of the shaft? Darryl Hudson needs it for my repair. For those interested the 5110 has 4 shaded poles. Each pole is approximately 5.6 ohms for a total of 22.4 ohms. Each pole is wound with 24awg single serve magnet wire. Each pole has 300 turns.Each shade has 23 turns of solid copper. Now to wind up some new coils! The newly wound coil @ 300 turns ohmed out at 5.4 ohms. Either the original wire is 25gauge or the resistance of the newer 24 is a tad less than the old 24awg. I am not sure that 0.2-0.3 ohms will make much of a difference but I like to be as close as possible. I may add another 20 turns to the coils to bump up the resistance to match. I am waiting on some magnet wire to come in so that I can wind the coils. I got bored and decided that I wanted to clean up the switch. How do you guys typically clean the laminates. If I soak them in assuming it will eat through any insulating varnish. 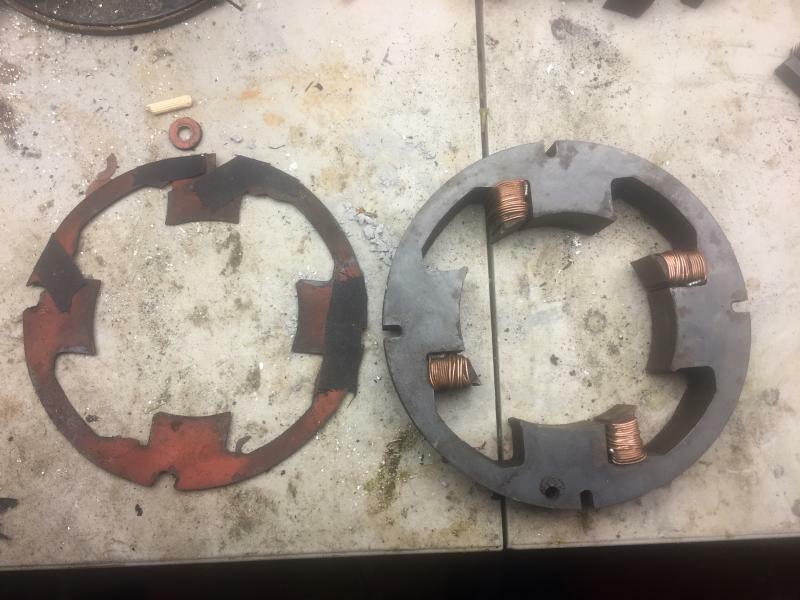 Also if I wanted to wind up a new speed coil does anyone know the number of turns and gauge of the speed coil. It looks close to 24awg. I may just retape it up and call it a day as I don't want to unwind it to count the turns. Bearing and Slingee installed and looking sharp! I'm lasering the fiber tomorrow if anyone would like a set shoot me a pm. I enjoyed reading this thread Gary, nice job and keep it coming! Page processed in 0.2835 seconds (28% database + 72% PHP). 29 queries executed.